Here it is! The cover for Ilona Andrews' fourth Kate Daniels novel--Magic Bleeds. I am seriously aching to get my hands on this one. 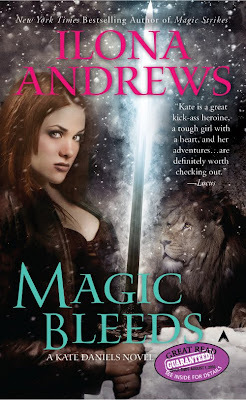 As you know, Magic Strikes (the 3rd Kate book) knocked my socks off and I can only imagine what the contents of the next one will do to me. What do you think of this cover? I love all the snow. And His Furry Majesty, of course. And Slayer. Ilona has written a post addressing some readers' concerns about what will happen in Magic Bleeds. She talks about trusting the author to know what's best for her characters and her world and it's just the most fabulous post. I highly recommend you go read it. In the meantime I'll just be here admiring the pretty cover and vainly wishing it was May 25th already! Oh! Oh! Oh Oh Oooooooo! I LOVE this cover. Great colors for the text and I just LOVE cover art with snow. Thanks for the heads up, Angie. I'm imagining that Ilona gets a lot of pressure for fans about Kate & Curran, but I'm totally fine---more than fine--with how it's all been working out so far and I do trust the author to write her best story no matter what happens and I won't be angry or devastated if what I want never happens. I was pleased when I read Ilona's post about Kate and Curran, but I trust her (and her husband) with this series. Even if things don't work out between Curran and Kate, I really believe they'll handle in a satisfying way. Seeing the new cover makes me want to pull out the other books for a reread, but I have too much on my plate to allow myself that. Maybe closer to the pub date. ooh, I like it! Lets hope that Kate and Curran get something going on! Karen, absolutely. And I'm dying for a re-read, but my copies have been loaned out to various people for what seems like forever! Must get them back. That or buy 2nd copies! Laura, I really, really share that hope. hehe. Oooh nice to see a cover. Ummm I will be the one dissenting voice and say that I'm not massively bowled over, not quite sure why. The colour scheme isn't quite doing it for me, I think. Also snow for a May release?? On the other hand, I notice the font size for the author name is now as large as the title AND they get the Great Read Guaranteed stamp (which Patricia Briggs also had, IIRC) - all good signs! Li, I hear ya. The colors of the title and name aren't my favorite. Too bright and cheery for Kate. I hadn't thought about the release time, but you're right. I think it works seeing it now as we're heading into snow season. Good point on the good signs. This series deserves so much attention! I love all the Kate Daniels covers.. I really like the colors on this one. I agree with you about the Mercy covers, when I'm reading I keep glancing back at the cover trying to get a feel for her, but she looks a tad bit over the top I'm positive thats not how she is dressed to work on VWs. I still love them though lol. Caitlin, definitely not. lol. I love them, too, though. The Mercy artist is really great!